Now comrades what is the nature of this life of ours? Lets face it our lives are miserable laborious, and short. We are born, we are given just as much food as will keep the breath in our bodies and those who are capable of it are forced to work to the last atom of our strength: and the very instant that our usefulness has come to an end we are slaughtered with hideous cruelty...The life of an animal is misery and slavery: that is the plain truth. Land animals killed in 2001 world wide for human consumption: 48 billion! Eight times the population of the world. This does not include other animals including wild animals or the millions of male chicks who are ground up. How many animals are killed each year in the UK? The total number of animals killed in British slaughterhouses in 2003 was approximately 900 million. This included 9.35 million pigs, nearly 15 million sheep, 28 million turkeys, 20 million ducks, over 850 million chickens and 2.25 million cattle. It is my hope that our descendants will look back at our inhumane system of factory farming and other animal exploitation with shock and horror and uncomprehending revulsion, much in the same way that we now look back on the atrocities that we as a species have carried out on one another throughout the ages and into the present day. In Animal Farm, before unfolding his vision of how life could be improved for farm animals if they ran the farm themselves, Old Major the pig laments the life of misery and cruelty suffered by farm animals. Although his account of the suffering experienced by farm animals was being used by Orwell to highlight the circumstances of many poor, working people, it is indeed an accurate summary of the life of a farm animal. His view of course did not take into account the rise of factory farming shortly after the end of World War Two, when the lot of a farm animal was indeed set to become considerably worse, when the traditional free range farms would become places of industry for the manufacture of food and where animals are treated as though they are inanimate commodities on a conveyor belt, confined in dark windowless cramped places with little or no room to turn round, where disease and starvation are rampant. Factory farming is suffering on a scale unimaginable. Indeed few who visit the supermarket and buy vacuumed packed meat, now barely resembling a once living creature, know anything about the conditions in which animals are kept as they endure their short miserable lives while awaiting their ultimate fate at the slaughter house to provide us with meat, a food that we do not need and which we are not biologically equipped to digest, or simply to be killed when their useful days are over. I think ignorance on the matter is one of the biggest problems in putting a stop to this massive abuse, it is one of the main reasons that this hideous cruelty has been allowed to continue for as long as it has. So lets look more closely at factory farming; most people are familiar with this practice but few really understand the nature of this one of the most horrific forms of animal abuse in the modern world today. 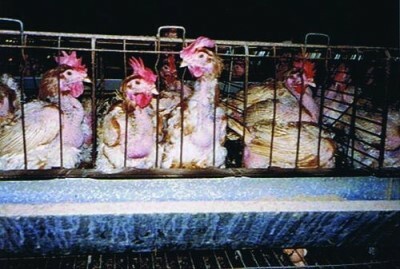 In short Factory farming is the practice of raising farm animals in close confinement at high stocking density, where a farm operates as a factory. The aim of factory farming is to produce as much meat and dairy products as quickly and as cheaply as possible in order to maximise profits. Please do not consider that the main purpose of factory farming is to feed people, in fact many people in developing countries suffer from starvation partly as a result of Factory farming. To keep profits high and costs down these unfortunate animals are given the bare minimum to survive. Housed in huge sheds these creatures are deprived of everything that makes life worth living. The grim reality of factory, or intensive farming, is the cruel practice of cramming as many animals as possible, into as small an area as possible. There is no room to move, these poor creatures are unable to stretch even their wings or legs, let alone roam in the sunshine or feel the warmth of the sun or the cool of the wind. They are deprived of rearing their own young or even to copulate in the normal way. 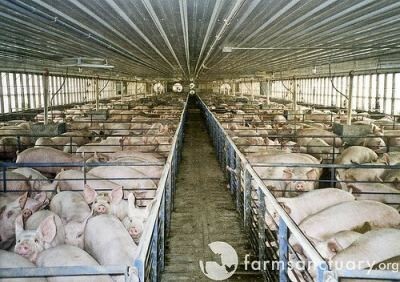 So cramped are the conditions in these sheds that most animals cannot even lie down comfortably or conversely, in the case of lactating pigs, they cannot even rise to a standing position or move at all as you see in the pictures below. As the picture 2*above shows, cattle are confined in sheds; cows used as breeding and milk producing machines. 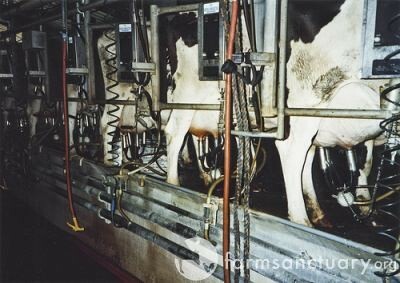 "Two or three times every day, dairy cows are hooked up to milk machines. They are commonly pushed to produce ten times more milk than is natural." 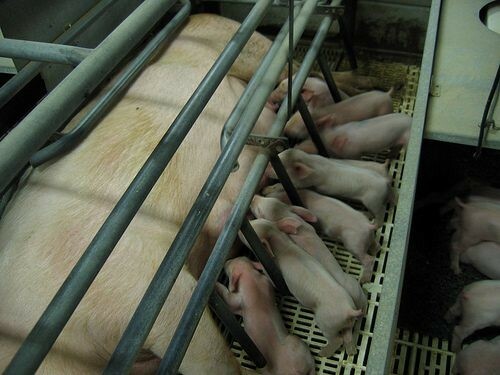 And even pigs, whom many people do not connect with factory farming are confined indoors in shocking filthy conditions, standing in their own excrement. Indeed, unbeknown to many people both pigs and sheep also suffer and die in inhumane circumstances, the details of which you may read in the links that follow, or trapped in fields exposed to the elements without shelter often suffering from exposure, such as sheep, who are also increasingly confined to sheds as you will see from the picture below. It may seem to be a contradiction to protest about sheep left to suffer from exposure and to equally object to their confinement in what could be considered a sheltered environment. There is however a huge difference. Here you see sheep in a factory farmed condition, they will never see the light of day, never be free to roam or behave in a natural way. The type of shelter to which I refer is access to natural shelter afforded by trees, often not available in fields, or barns with free access during inclement weather, with straw on the floor, not mettle mesh to stand or sit on as is the case for these poor creatures. ﻿And than when the the unfortunate animal has outlived his usefulness he is taken to the slaughterhouse to meet a painful end. There is no such thing as a humane way of killing any creature; in fact to bring about the death of another being, to deny him his natural course of existence is in itself an act of profound cruelty that cannot be justified. There is nothing humane about death. Consequently despite laws and rules about the treatment of animals in captivity either in zoos or as farm animals these circumstance can never be seen on any level as humane, (this is particularly the case for factory farmed animals), despite endeavours to make us feel that this is the case. No creature wishes his freedom curtailed or his life ended, all creatures fear death. Survival is one instinct all animals share, including man. I consider that animals exhibit instinctive behaviours and that includes man, but again like man, in addition to instinct there is ﻿sentience﻿ in all creatures, and most certainly all creatures experience both physical and emotional pain as you can read in the above linked webpage on Sentience in Farm Animals. Although reference is made to the UK and USA, the conditions, and worse, you will read about here and by visiting the websites at the end of this page, occur globally. Here in the UK alone each year 850 million farm animals are killed annually, that's three million animals killed each and everyday, plus countless millions of fish. In the USA more than 10 billion land animals plus billions more aquatic animals are slaughtered for food every year. That is more than 1 million animals every hour, a staggering number of animals killed every second of every day, a continual stream of death. Before meeting a painful death, and bear in mind that no creature can be slaughtered without experiencing pain, farm animals are reared in shocking and painful circumstances of deprivation and confinement; deformed, crippled and in pain as a result of selective breeding and the use of antibiotics to produce larger animals than nature intended. Then they are killed, often after travelling for miles crammed into lorries in extremes of temperatures, often when fully conscious after being painfully or incompletely stunned to provide you with meat - a food that you really don't need to be healthy - and the meat industry with huge profits. Here in the UK we pride ourselves as animal lovers. Can we really in all honesty consider ourselves animal lovers if we allow such atrocities to continue. Most of the meat you will eat will have come from a factory farm. I consider that many people would feel differently about eating meat if they knew the suffering that is undergone to put meat on their tables. Please be aware this film and the one below has shocking imagery of animal cruelty. The only choice is to go meat free, go vegan and save animals from the horror of factory farming, any farming. I have included this film as it a powerful and moving piece about the atrocity of factory farming. However I advocate a vegan diet and the abolition of not only factory farming but all live stock farming. Think differently about sheep is an animal rights website. Nonetheless from time to time there may be included here films or articles and petitions that involve animal welfare issues if in general terms they aim towards abolition and animal liberation. Animal rights and animal welfare can at times be a very grey area and the distinction between the two can be difficult. I believe that in the future people will be horrified, in a similar way as most of us are today when we learn about the misery of slavery and the atrocities of WW2, that we took the lives of these gentle sentient creatures and for no other reason than to sate our appetite for meat, at the expe﻿nse not only of the precious lives of these defenceless animals but also at the expensive of both people in developing nations and the destruction of the environment. When it comes to having a central nervous system, and the ability to feel pain, hunger, and thirst, a rat is a pig is a dog is a boy. The animals we eat are thinking feeling beings, they like us experience pleasure, fear and pain, in the case of farm animals there are however no moments of pleasure. Consider your cat or dog, you know do you not that your pet feels emotion, he or she experiences fear; hear your dog barking if someone comes to the door, or see your cat bristle, grow tense when she is frightened. You can experience your dog's pleasure when he plays ball or rushes in to eat his favourite meal or comes up to you to be patted. Your cat rubs past your legs and purrs with obvious delight showing both affection and pleasure. These same emotions are present in farm animals. A wide range of emotion is experienced in all farm animals including pigs, chickens, cattle, sheep and even fish, a creature which contrary to popular belief suffers pain and stress and has a nervous system similar to mammals. Yet despite these similarities, and the most common without exception and most undeniable is the ability to feel pain, we treat these animals differently than we treat our cat or dog. ﻿You would not be allowed, nor neither would you wish to treat your cat or dog in the way farm animals are treated. You would not be allowed to confine your pet cat in a cage with barely enough room to turn round, standing in her own faeces in a dark windowless shed with lots of other cats, artificially inseminate her and take her kittens away when they are born. And when she has either outlived her usefulness as a breeding machine to replenish stock or she is old enough to be slaughtered for food, usually from around two or three months to three or four years of age as is the case for sheep, she is taken in a cramped crowded lorry transported for many miles in the cold or heat before she ends her life in the abattoir with her throat cut, often whist still conscious. You would be prosecuted for animal cruelty would you not if you did just one of those things to your cat or dog. Yet every time you go into a supermarket, your local butcher or eat at a cafe you condone this kind of treatment to animals very similar to your cat or dog. There is and indeed should be great concern about both the welfare of farm animals and the animal called man. In relation to factory farming in recent years the implications both for the welfare of farm animals and public health are a cause of concern, for example the the most well-known being the salmonella in eggs scandal and CJD. However in my opinion there is not as great a concern as there should be and more needs to be done to make the public aware of these issues, in particularly the shocking cruelty such as you see below. Undercover on an Iowa Pig Farm. I could not get this image of this poor pig and her piglets out of my mind, the suffering this poor frightened sow must be enduring on both a physical and emotion level surely must touch the hearts of those who care about animals, those who care about moral treatments of sentient intelligent creatures. In an earlier stage of our development most human groups held to a tribal ethic. Members of the tribe were protected, but people of other tribes could be robbed or killed as one pleased. Gradually the circle of protection expanded, but as recently as 150 years ago we did not include blacks. So African human beings could be captured, shipped to America and sold. In Australia white settlers regarded Aborigines as a pest and hunted them down, much as kangaroos are hunted down today. Just as we have progressed beyond the blatantly racist ethic of the era of slavery and colonialism, so we must now progress beyond the speciesist ethic of the era of factory farming, of the use of animals as mere research tools, of whaling, seal hunting, kangaroo slaughter and the destruction of wilderness. We must take the final step in expanding the circle of ethics. To a man whose mind is free there is something even more intolerable in the sufferings of animals than in the sufferings of man. For with the latter it is at least admitted that suffering is evil and that the man who causes it is a criminal. But thousands of animals are uselessly butchered every day without a shadow of remorse. If any man were to refer to it, he would be thought ridiculous. And that is the unpardonable crime. Farm animals are like us in many ways. The most important of which is that they all have a brain and nervous system, just like you, your cat or dog, therefore even without scientific evidence it is common sense that if you or your pet feel pain than so do they. Yet many practices in farming overlook this. The only acceptable option to 'humane' slaughter is no slaughter. I consider that Animals are on earth for their own purposes, they are not here for our use to supply us with food, cloths, entertainment, or medical research. They should be left unmolested to go their own way, the only intervention if any should be in the animal's interests, such as medical intervention. We I believe should offer medical assistance or any other assistance that is beneficial to animals in much the same way as we do for the animal called man. If 'rights' exist at all—and both feeling and usage indubitably prove that they do exist—they cannot be consistency awarded to men and denied to animals, since the same sense of justice and compassion apply in both cases. 1) Holt S. "The Food resources of the ocean, Scientific American. 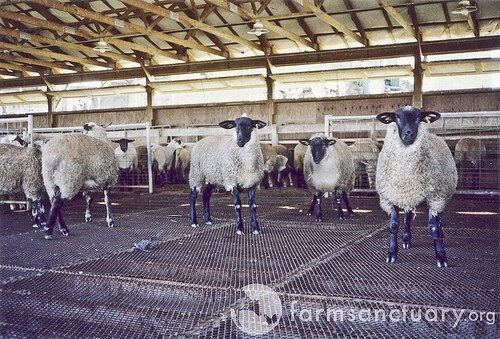 Farrowing Crates on Flickr - Photo Sharing! Credit: Hooked up to milk machines on Flickr - Photo Sharing!